A father and daughter both had multiple pathological fractures and nodal osteoarthropathy. The father, aged 50 years, had at least 20 healed fractures of the axial and appendicular skeleton, sustained by minor trauma over his 50-year lifespan, many of which had been surgically fixed prior to his first presentation to us. Fractures of the clavicles, thoracic cage and long bones of the arms and legs, had healed with malalignment and deformity. Healed fractures were complicated by ankylosis of the cervical vertebrae and both elbows. He also had osteoarthritis of the hands, with exuberant osteophytosis, and profound perceptive deafness. His general health was good, his intellect and facies were normal, and his sclerae were white. The daughter, aged 27 years, had sustained at least seven fractures of the axial and appendicular skeleton following trivial injuries, in distribution similar to those of the father. She had also experienced painful swelling of the fingers, which preceded progressive development of nodal osteoarthropathy. Her hearing was normal. In both individuals, biochemical and immunological investigations yielded normal results. It was not possible for molecular studies to be undertaken. Pedigree data were consistent with autosomal dominant transmission, and this disorder appeared to be a previously undocumented heritable skeletal dysplasia. The authors thank Dr Riettte du Toit, Consultant in Medicine and Rheumatology, Tygerberg Hospital, for her contribution to the clinical examination of the patients. 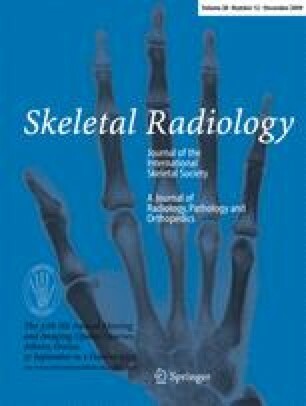 We are grateful to Professor J. Spranger and members of the International Skeletal Society for their critical discussion of the possible diagnosis in the affected persons. The project was supported by the South African Medical Research Council and the National Research Foundation. Steiner RD, Pepin MG, Byers PH. Osteogenesis imperfecta. In: GeneReviews: genetic disease online reviews at GeneTests-GeneClinics (database online). Available at http://www.geneclinics.org.